Organic farmers who grow their crops in soil participate in a protest in Stowe, Vt., in 2015. Critics say the organic label is at essence about the health of soil, and did not want to allow crops raised in hydroponic systems to be labeled organic. Their efforts to strip hydroponic vegetables of the organic label failed this week. Fluid-fed organic tomatoes grow in a greenhouse owned by Wholesum Harvest in the Mexican state of Sonora, about 30 miles from the U.S. border. "It really goes to the foundation of what organic farming means," says Chapman, who grows vegetables on his farm in East Thetford, Vt. Abby Youngblood, executive director of the National Organic Coalition, said that "we're seeing, here in Jacksonville, a lot of support for the founding principles of organic, which are really about soil health, regenerating the soil," rather than simply feeding plants the nutrients that they need. 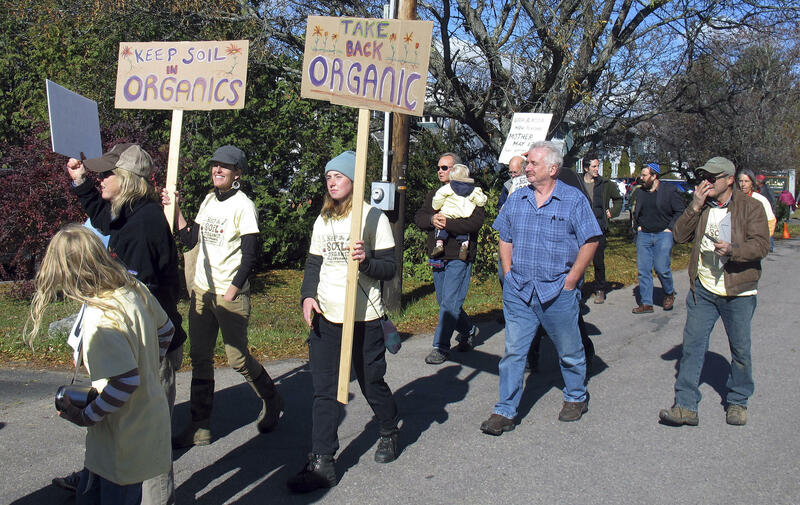 Their protests, however, failed to convince a majority of the board, which voted, 8-7, against a ban on hydroponic methods in organic farming. Members of the government-appointed board, which advises the U.S. Department of Agriculture on rules for the organic industry, were persuaded instead by the arguments of companies like Wholesum Harvest, which grows tomatoes and other vegetables in high-tech greenhouses. According to the company's Jessie Gunn, there are big environmental benefits to growing vegetables indoors, with their roots in small containers. "We can grow our tomatoes organically with 3 to 5 gallons of water, per pound of production, as opposed to growing tomatoes in open fields, which can use anywhere from 26 to 37 gallons of water," Gunn says. Growing crops in open fields, she says, "uses more water, more land, destroys more natural habitat. I mean, what is the true essence of organic?" That is, in fact, the central question, and it has provoked a bitter divide in the organic industry. On one side are organic traditionalists who are committed to the ideas of Albert Howard, an English botanist who inspired the organic farming movement. Howard wrote that "the health of soil, plant, animal and man is one and indivisible." For farmers like Chapman, nurturing the soil is the essence of organic farming, and a vegetable grown without its roots in the soil simply cannot be called organic. On the other side are companies like Wholesum Harvest or the berry giant Driscoll's, who say that they are delivering what consumers expect from that organic label: Vegetables grown without synthetic pesticides, year-round, and affordably. "Don't tell me that people in Duluth, Minn., don't want strawberries in the middle of January, because I know it's not true. And they want them grown organically," Gunn says. The battle is over more than philosophy. It's about market share. Hydroponic methods, deployed on an industrial scale, are taking over an increasing share of sales to supermarkets. Chapman says that most organic tomatoes sold in supermarkets today already are grown without touching the soil. "What will happen, very quickly, is that virtually all of the certified organic tomatoes in supermarkets will be hydroponic," Chapman says. "Virtually all of the peppers and cucumbers [will be hydroponically grown]. A great deal of the lettuce. And most of the berries." Chapman calls it a "tragic situation." The Recirculating Farms Coalition, however, which represents hydroponic producers, welcomed the NOSB's vote. Marianne Cufone, the coalition's executive director, issued a statement saying that "the NOSB is sending a critical message that sustainability and innovation are valuable in U.S. agriculture." Dozens of organic farmers crowded into a hotel room in Jacksonville, Fla., this week. And they had a fierce debate over the meaning of the word organic. 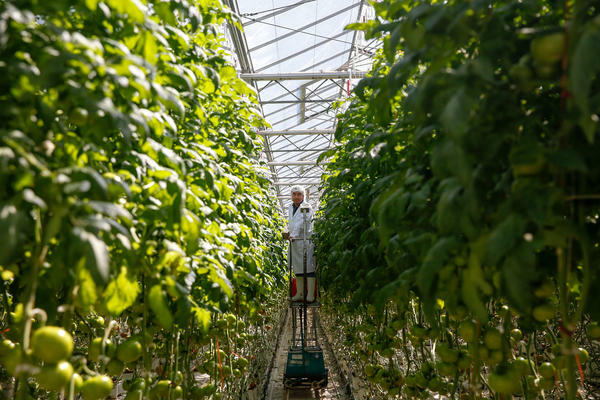 One of the contentious issues here is whether vegetables that are grown in high-tech greenhouses, fed by nutrients dissolved in water - should those be labeled organic? NPR's Dan Charles has the story. DAN CHARLES, BYLINE: Dave Chapman grows organic vegetables on a farm in East Thetford, Vt. And he sees something in supermarkets everywhere that just drives him crazy. DAVE CHAPMAN: Over a third of the tomatoes, over a third of the peppers, over a third of the cucumbers that are being certified as organic are hydroponic. CHARLES: Those plants live in greenhouses with their roots in little containers filled with fiber from coconut husks or some other material. The nutrients they need flow through little plastic tubes dissolved in water. It bothers Chapman that people don't realize this. Even the manager of a supermarket produce department whom he met last year didn't know it. CHAPMAN: And he said, well, that doesn't seem right. And I said, no, I don't think it is right. CHARLES: There are lots of detailed rules that farmers have to follow to get organic certification, about how to control pests and fertilize their fields. But Chapman says, really, the heart of it all is building healthier, more fertile soil. And he thinks if vegetables don't grow in real soil, they simply aren't organic. This week, he and other like-minded farmers tried to get a government-appointed committee, the National Organic Standards Board, to add a new rule to that organic rulebook. Their proposal - no crops that are grown on a liquid diet can be sold as organic. Their opponents, though, argued just as loudly that banning hydroponics would betray organic ideals. JESSIE GUNN: My personal take is that it flies in the face of progress in organics. CHARLES: Jessie Gunn from the company Wholesum Farms (ph), which operates big greenhouses in Arizona and Mexico, says organic food means fewer pesticides, also preserving the environment. And she says, think about what it means to grow crops outdoors. GUNN: Which uses more water, which uses more land, which destroys more natural habitat. I mean, like, what is the true essence of organic? CHARLES: After two days of passionate debate, the board sided with the hydroponic farmers by a vote of 8-7. Those vegetables can still be sold as organic. And Dave Chapman thinks more of them will be sold. CHAPMAN: I think in the not-too-distant future, virtually all of the tomatoes, cucumbers, peppers that are sold as organic will be hydroponic. CHARLES: This is just the latest controversy over the true meaning of organic. Another hotly debated standard adopted at the end of the Obama administration requires organic egg producers to give their hens more space outdoors. Big egg producers protested, and the Trump administration put that regulation on hold. It's supposed to decide whether to let it go into effect within two weeks. CHARLES: Dan Charles, NPR News. Transcript provided by NPR, Copyright NPR. Carbon dioxide levels in the atmosphere hit a new record in 2016. 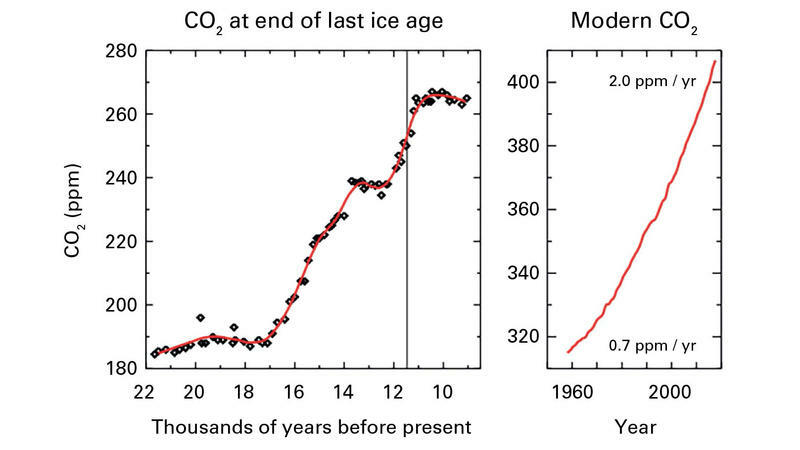 The concentration of the heat-trapping gas is higher than it’s been in at least 800,000 years, including all of human history. That's the word from the United Nations’ World Meteorological Organization. The WMO says last year's CO2 spike was 50 percent greater than the average increase over the past decade, which Petteri Taalas, the organization’s secretary-general, says is very bad news. 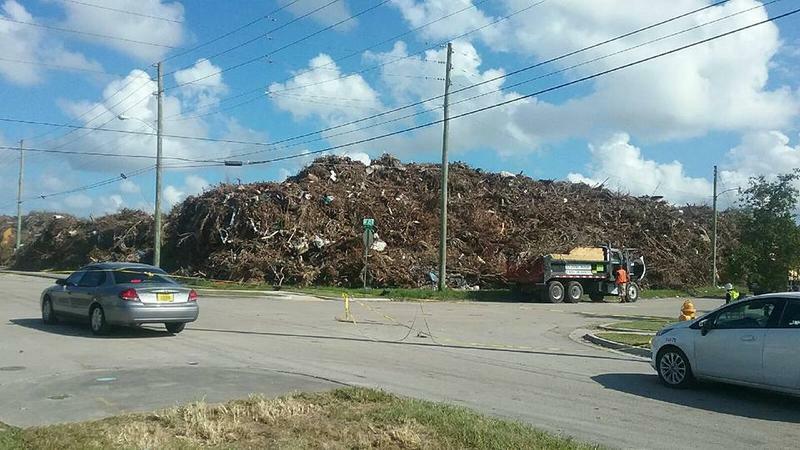 Responding to Facebook posts accusing them of unfairly dumping debris in underserved neighborhoods, Miami-Dade County officials said Tuesday the foliage downed by Irma is a problem shared by everyone in the county.